Good, but not as good as Season 1. I really enjoyed rewatching this season. I loved how they flow with the first season and we get to see more growth out of the characters and their family. I just never seemed to like the new people as much. That seems to be my problem with a lot of shows who introduce new mains. I loved this season of Digimon mainly because they started up by picking up where they left off with new Digidestined as well as the original, and older cast. My favorite part of this season is Ken and how he went from Digimon Emperor to being apart of the Digidestined team. I also liked how Ken's change from bad to good set off a chain of events that caused them to find out who had really been controlling Ken, and it even gets more and more confusing after; but you would have needed to the series from the very first episode all the way to the end to figure it out, that is why I love Digimon, they make it somewhat confusing but are still able to tell you a comprehensible story. 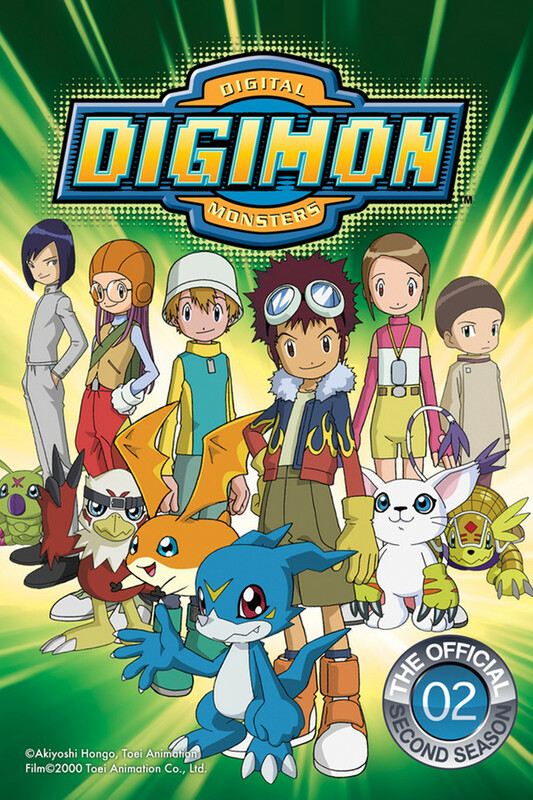 Digimon definitely deserved more credit than it had gotten during the 2000's. I started watching the Adventure series for the first time this past year. I was into Pokemon and Yu-Gi-Oh when I was young and didn't have the time (or money) to follow Digimon too. Adventure 01 was a fun watch. The low quality and heavily reused animation actually kinda charmed me. It all felt very nostalgic even though I had never seen it. Most importantly, Adventure 01 does one key thing well, and that is its characters. The 7 (eventually 8) Chosen Children are well defined and fun to be around (especially when I switched from the English dub to the much more tonally consistent Japanese sub). The characters all have well defined personalities with flaws that are dealt with over the course of the show and ties into their Digimon's ability to evolve to higher levels. The Digimon partners aren't really their own characters, but serve to complement the kid's personality (like Taichi and Agumon both being energetic and hardworking) or contrast to them (like Jou being reserved while Gomamon is outgoing). None of this is particularly deep, but it is well defined and engaging. Adventure 01 has plenty of issues too of course. Long segments of the plot involve the kids just wandering around without purpose. The show never bothers explaining the mechanics of its setting in much detail. Villains come and go without much explanation as to their motives, which are usually hand-waved away by connecting them to the 'forces of darkness'. The show also has a habit of using the digivices as a deus ex machina to push the plot forward. Plus, the character work that shone early on gets muddled towards the end. These issues add up to make the show feel unplanned and poorly structured. So as I started watching Adventure 02, I was excited because it seemed like it solved a lot of the issues I had with 01. The aimless plot structure of wandering around the digital world in 01 was swapped for a cool dynamic of jumping between the real and digital worlds in 02. This allowed for a bit of slice-of-life interactions that fleshed out the characters in the real world, and the characters always had a clear goal when they were in the digital world. There was a well defined and interesting villain in Ken AKA the Digimon Kaiser, whose plots couldn't be stopped by just pointing digivices at a thing. There were even hints of a larger enemy, Dagomon, operating behind the scenes that is foreshadowed early on. The older Chosen Children were also still around, making cameos and providing mentorship to the new group. The animation even got a (small) bump in quality. The series felt confident, like it knew what it was doing and where it was going. Sadly, the show falls apart quickly once Ken is defeated as a villain and joins the team. The show doesn't know what to do next, and new villains and arcs are dropped as quickly as they begin. Archnemon and Mummymon are introduced but never get any development to turn them into engaging villains. BlackWarGreymon's internal conflict was potentially interesting, his arc is abandoned and the Holy Stones central to his plot aren't explained and turn out to be pointless. The episodes involving traveling the world to work with international Chosen Children could've been great but they give that arc no time or thought. Oikawa and Demon seemed cool since they were two villains with competing interests, but then Demon is abruptly defeated and Oikawa doesn't get much development. And then VamDevimon is introduced as the final big bad out of nowhere and his defeat has no narrative weight. And they STILL end up falling back on the lame plot device of 'point digivice at thing to solve problem'. Worse, in all of this plot mess, the main characters don't get space to develop. Daisuke is basically just a clone of Taichi with less character development. He just becomes the respected group leader halfway through the season without explanation and loses his few personality quirks from earlier. Takeru's anger is established but never expanded upon as a character flaw. Hikari has nothing to do once the Dagomon plot is abandoned. And Iori and Miyako are never given much development, even in the first half of the season. There is easily potential there, with Iori being a quiet and reserved only child who is missing a father, and Miyako being a loud, abrasive personality from a large family, but these ideas never come to fruition. The theme from the first season of tying the Digimons' evolutions to the partners' personal growth isn't really present here. The three evolutions each kid gets are never earned by the partners maturing, they just happen when an object is found or when the Kaiser is defeated. The fusion-based Jogress Evolutions require two kids to be in-sync with one another, but this only works well with Daisuke and Ken because Ken has to learn to open up to the others. There is no real conflict to address between the pairs of Hikari and Miyako, and Iori and Takeru. Nothing changes when they achieve the evolution, its just a cool but meaningless power boost. Still, when the show hits its stride in its first half, it works really well. It's peaks are the high watermark for both seasons of Adventure, mostly because of Ken. Ken is an engaging and tragic antagonist and his redemption and transition into an ally is very satisfying. Plus, the Digimon designs are improved and there are more animation cuts of higher quality. I would recommend watching only the first half, up until episode 27, maybe even 23. The first half alone ranks as a 4/5 for me, but a 1/5 second half makes it a soft 3/5 overall. Please, Upload the subbed original version for all digimon series. Not only the dialogue changes but also the Original Sound Track. Keep going for subs over dubs as you were doing at the beginning. The same for all other animes that are only offered in Dubbed versions; as much as some people like it I am sure I am speaking over majority and even some dub lovers agreed to the fact that original is always better. On the other hand, subbed version allows you call on more viewers since they have alternatives over a single language streaming video. Watching Digimon as a kid was the highlight of my day. Now that I'm older, I decided to watch it initially for nostalgia. Back then all I cared about was the fighting and stuff. Now that I rewatched the series, I appreciate it in a whole new light. I am old enough to understand the plot on a more complex level and honestly the character development that goes into it is really good. Ken is by far my favorite Digimon character in terms of character development. I might like Izzy more, but the amount of detail that goes into Ken (and everyone else, but Ken in particular) is astounding. As a kid, i loved this series much more than the first series. Now as an adult going back and re-watching, it felt very dull. What i mean by this is, it just feels like a rehashed version of the original. 15 minutes of story with 5 minutes of action using dealing with one of the digimon reaching a new digivolution. I mean i love this series a lot, but as a continuation of the original i wish they would have mixed it up a bit. Digimon was my favorite anime growing up and I am very excited to see them on CR now. Seasons 1 and 2 are the best by far, they transition almost seamlessly and the story is pretty good. There is a good mix of humor, action and dark tones that all play very well together for a "kids show." Very nostalgic, my childhood was just passing by with in each episode. Love to see Digimon is around, just wish the movie and subtitle was along. Digimon took me back when I was young watching it on t.v. Only problem was that I couldn't watch all of the episode in order. Just glad that I could watch it in order and to revive my childhood memory.